Microsoft Power BI Desktop is a free application that lets you connect to, transform, and visualize your data. The Text Analytics service, part of Microsoft Azure Cognitive Services, provides natural language processing. Given raw unstructured text, it can extract the most important phrases, analyze sentiment, and identify well-known entities such as brands. Together, these tools can help you quickly see what your customers are talking about and how they feel about it. Microsoft Power BI Desktop. Download at no charge. A Microsoft Azure account. Start a free trial or sign in. A Cognitive Services API account with the Text Analytics API. If you don't have one, you can sign up and use the free tier for 5,000 transactions/month (see pricing details to complete this tutorial. The Text Analytics access key that was generated for you during sign-up. Customer comments. You can use our example data or your own data. This tutorial assumes you're using our example data. To get started, open Power BI Desktop and load the comma-separated value (CSV) file FabrikamComments.csv that you downloaded in Prerequisites. This file represents a day's worth of hypothetical activity in a fictional small company's support forum. Power BI can use data from a wide variety of sources, such as Facebook or a SQL database. Learn more at Facebook integration with Power BI and SQL Server integration with Power BI. 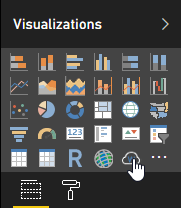 In the main Power BI Desktop window, select the Home ribbon. 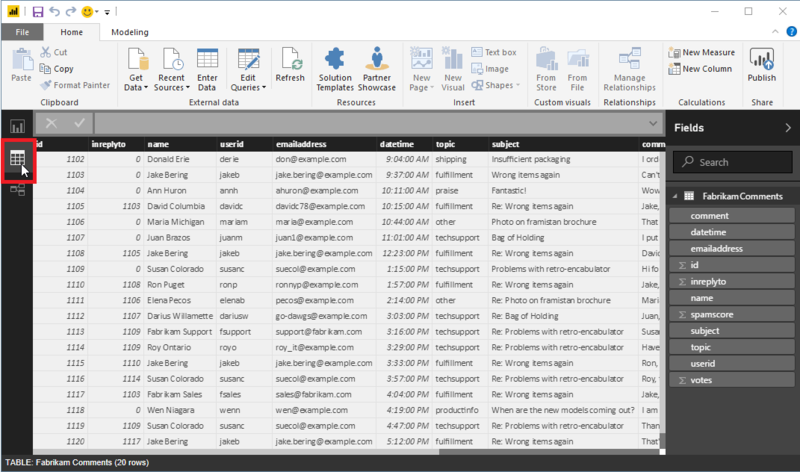 In the External data group of the ribbon, open the Get Data drop-down menu and select Text/CSV. The Open dialog appears. Navigate to your Downloads folder, or to the folder where you downloaded the FabrikamComments.csv file. Click FabrikamComments.csv, then the Open button. The CSV import dialog appears. 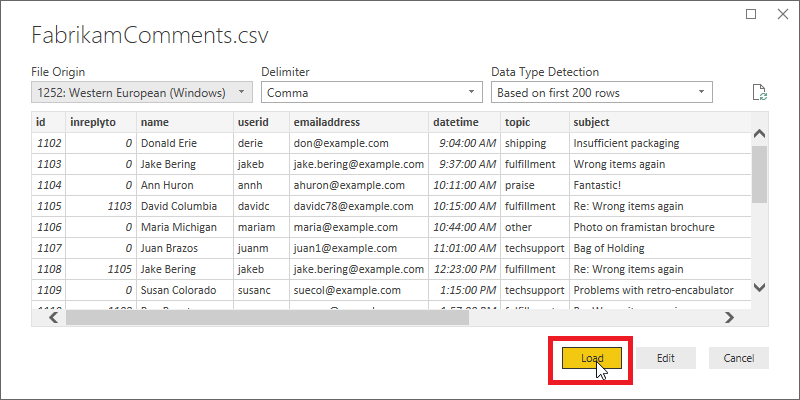 The CSV import dialog lets you verify that Power BI Desktop has correctly detected the character set, delimiter, header rows, and column types. This information is all correct, so click Load. To see the loaded data, click the Data View button on the left edge of the Power BI workspace. A table opens that contains the data, like in Microsoft Excel. You may need to transform your data in Power BI Desktop before it's ready to be processed by the Key Phrases API of the Text Analytics service. The sample data contains a subject column and a comment column. With the Merge Columns function in Power BI Desktop, you can extract key phrases from the data in both these columns, rather than just the comment column. In Power BI Desktop, select the Home ribbon. In the External data group, click Edit Queries. Select FabrikamComments in the Queries list at the left side of the window if it isn't already selected. Now select both the subject and comment columns in the table. You may need to scroll horizontally to see these columns. First click the subject column header, then hold down the Control key and click the comment column header. Select the Transform ribbon. In the Text Columns group of the ribbon, click Merge Columns. The Merge Columns dialog appears. In the Merge Columns dialog, choose Tab as the separator, then click OK.
You might also consider filtering out blank messages using the Remove Empty filter, or removing unprintable characters using the Clean transformation. If your data contains a column like the spamscore column in the sample file, you can skip "spam" comments using a Number Filter. The Key Phrases API of the Text Analytics service can process up to a thousand text documents per HTTP request. Power BI prefers to deal with records one at a time, so in this tutorial your calls to the API will include only a single document each. The Key Phrases API requires the following fields for each document being processed. id A unique identifier for this document within the request. The response also contains this field. That way, if you process more than one document, you can easily associate the extracted key phrases with the document they came from. In this tutorial, because you're processing only one document per request, you can hard-code the value of id to be the same for each request. text The text to be processed. The value of this field comes from the Merged column you created in the previous section, which contains the combined subject line and comment text. The Key Phrases API requires this data be no longer than about 5,120 characters. language The code for the natural language the document is written in. All the messages in the sample data are in English, so you can hard-code the value en for this field. Now you're ready to create the custom function that will integrate Power BI and Text Analytics. The function receives the text to be processed as a parameter. It converts data to and from the required JSON format and makes the HTTP request to the Key Phrases API. The function then parses the response from the API and returns a string that contains a comma-separated list of the extracted key phrases. Power BI Desktop custom functions are written in the Power Query M formula language, or just "M" for short. M is a functional programming language based on F#. You don't need to be a programmer to finish this tutorial, though; the required code is included below. In Power BI Desktop, make sure you're still in the Query Editor window. If you aren't, select the Home ribbon, and in the External data group, click Edit Queries. Now, in the Home ribbon, in the New Query group, open the New Source drop-down menu and select Blank Query. A new query, initially named Query1, appears in the Queries list. Double-click this entry and name it KeyPhrases. Now, in the Home ribbon, in the Query group, click Advanced Editor to open the Advanced Editor window. Delete the code that's already in that window and paste in the following code. The examples below assume the Text Analytics API endpoint begins with https://westus.api.cognitive.microsoft.com. Text Analytics allows you to create a subscription in 13 different regions. If you signed up for the service in a different region, please make sure to use the endpoint for the region you selected. You can find this endpoint by signing in to the Azure portal, selecting your Text Analytics subscription, and selecting the Overview page. Replace YOUR_API_KEY_HERE with your Text Analytics access key. You can also find this key by signing in to the Azure portal, selecting your Text Analytics subscription, and selecting the Overview page. Be sure to leave the quotation marks before and after the key. Then click Done. Now you can use the custom function to extract the key phrases from each of the customer comments and store them in a new column in the table. In Power BI Desktop, in the Query Editor window, switch back to the FabrikamComments query. Select the Add Column ribbon. In the General group, click Invoke Custom Function. The Invoke Custom Function dialog appears. In New column name, enter keyphrases. In Function query, select the custom function you created, KeyPhrases. A new field appears in the dialog, text (optional). This field is asking which column we want to use to provide values for the text parameter of the Key Phrases API. (Remember that you already hard-coded the values for the language and id parameters.) Select Merged (the column you created previously by merging the subject and message fields) from the drop-down menu. If everything is ready, Power BI calls your custom function once for each row in the table. It sends the queries to the Key Phrases API and adds a new column to the table to store the results. But before that happens, you may need to specify authentication and privacy settings. After you close the Invoke Custom Function dialog, a banner may appear asking you to specify how to connect to the Key Phrases API. Click Edit Credentials, make sure Anonymous is selected in the dialog, then click Connect. You select Anonymous because the Text Analytics service authenticates you using your access key, so Power BI does not need to provide credentials for the HTTP request itself. If you see the Edit Credentials banner even after choosing anonymous access, you may have forgotten to paste your Text Analytics access key into the code in the KeyPhrases custom function. Next, a banner may appear asking you to provide information about your data sources' privacy. Click Continue and choose Public for each of the data sources in the dialog. Then click Save. Once you have dealt with any banners that appear, click Close & Apply in the Home ribbon to close the Query Editor. Power BI Desktop takes a moment to make the necessary HTTP requests. For each row in the table, the new keyphrases column contains the key phrases detected in the text by the Key Phrases API. Now you'll use this column to generate a word cloud. 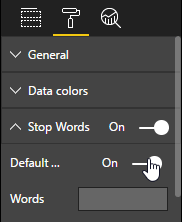 To get started, click the Report button in the main Power BI Desktop window, to the left of the workspace. Why use extracted key phrases to generate a word cloud, rather than the full text of every comment? The key phrases provide us with the important words from our customer comments, not just the most common words. Also, word sizing in the resulting cloud isn't skewed by the frequent use of a word in a relatively small number of comments. 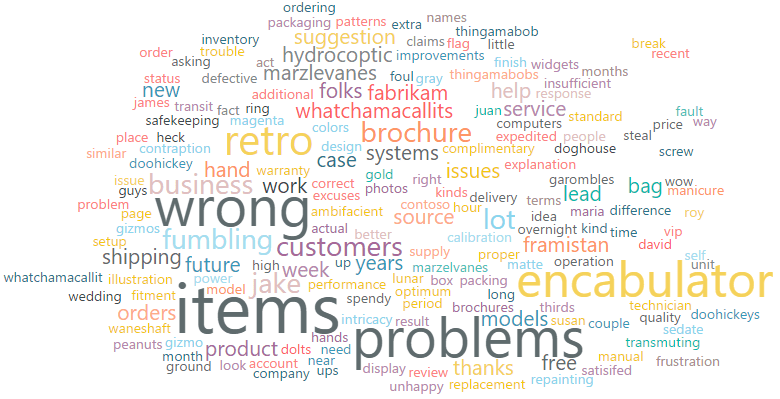 If you don't already have the Word Cloud custom visual installed, install it. In the Visualizations panel to the right of the workspace, click the three dots (...) and choose Import From Store. Then search for "cloud" and click the Add button next the Word Cloud visual. 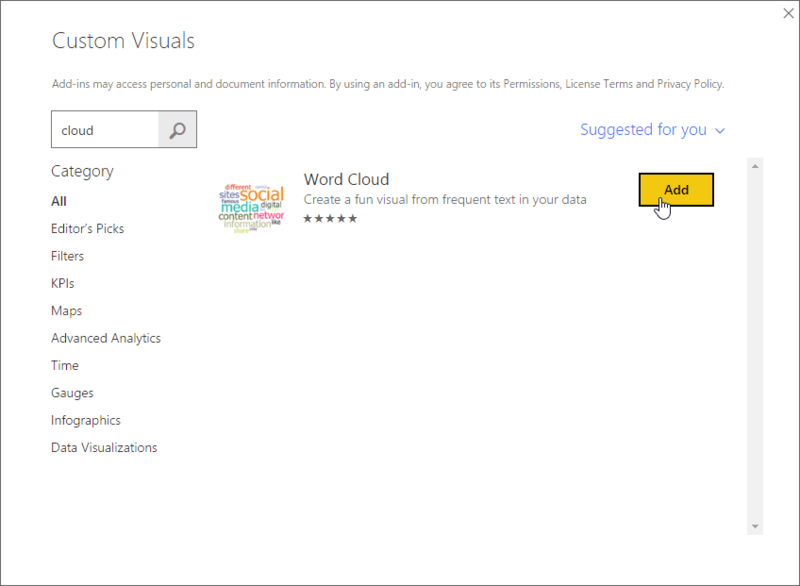 Power BI installs the Word Cloud visual and lets you know that it installed successfully. First, click the Word Cloud icon in the Visualizations panel. A new report appears in the workspace. Drag the keyphrases field from the Fields panel to the Category field in the Visualizations panel. The word cloud appears inside the report. Now switch to the Format page of the Visualizations panel. In the Stop Words category, turn on Default Stop Words to eliminate short, common words like "of" from the cloud. Down a little further in this panel, turn off Rotate Text and Title. 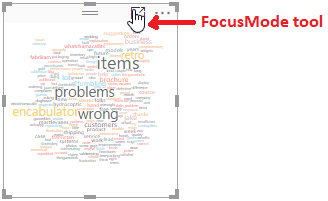 Click the Focus Mode tool in the report to get a better look at our word cloud. The tool expands the word cloud to fill the entire workspace, as shown below. The Text Analytics service, one of the Cognitive Services offered by Microsoft Azure, also provides sentiment analysis and language detection. The language detection in particular is useful if your customer feedback isn't all in English. Both of these other APIs are similar to the Key Phrases API. That means you can integrate them with Power BI Desktop using custom functions that are nearly identical to the one you created in this tutorial. Just create a blank query and paste the appropriate code below into the Advanced Editor, as you did earlier. (Don't forget your access key!) Then, as before, use the function to add a new column to the table. The Sentiment Analysis function below returns a score indicating how positive the sentiment expressed in the text is. Here are two versions of a Language Detection function. The first returns the ISO language code (for example, en for English), while the second returns the "friendly" name (for example, English). You may notice that only the last line of the body differs between the two versions. Finally, here's a variant of the Key Phrases function already presented that returns the phrases as a list object, rather than as a single string of comma-separated phrases. Returning a single string simplified our word cloud example. 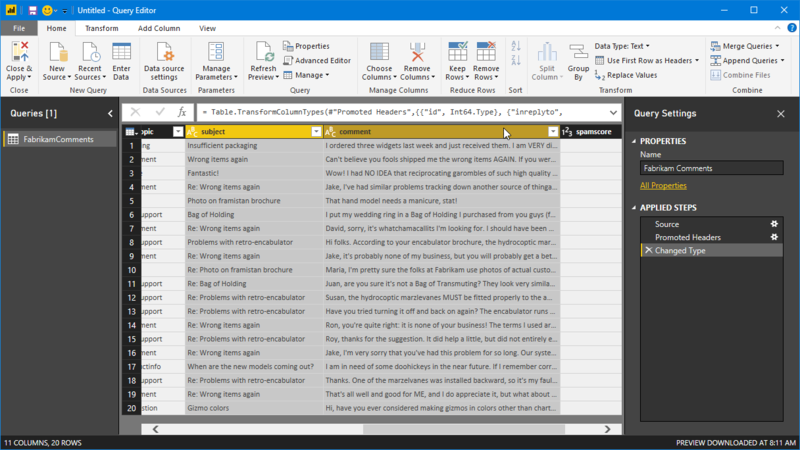 A list, on the other hand, is a more flexible format for working with the returned phrases in Power BI. You can manipulate list objects in Power BI Desktop using the Structured Column group in the Query Editor's Transform ribbon. Learn more about the Text Analytics service, the Power Query M formula language, or Power BI.